The Faulkner Legal Group Project Used White, Black, and Silver for a Refined Look. While Searching for a Logo and Site Theme, the Sun Reflecting Off a Broom Handle in the Garage Caught My Eye. I Grabbed My Nikon and Took Some Reflection and Gradiant Photos. I Processed the Nikon Photos of the Broom Handle in Photoshop to Get This Gradient Texture. The Broom Handle Texture Became the Background for The Company Logo Design I Created in Photoshop. The Owner Liked the Design So Much, He Hired a Sign Company to Duplicate the Logo Design as a Wall Sign. 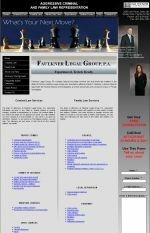 Faulkner Legal Group was a legal firm in Winter Park, FL for several years, and our meeting was so odd, I simply must share the story. One late Friday afternoon, I was at my computer parts wholesaler stocking up on supplies for a weekend job and waiting in the checkout line, when I overheard the cashier tell a caller that they did not service computers - they only sold parts. The caller must have been persistent as I next heard the cashier say, "No, I'm sorry sir. We don't know anyone who can recover data from a crashed computer." At hearing this, I began jumping up-and-down while waving my arms from the back of the line. I caught the cashier's attention and ran up with a business card. She told the caller to call my number. By the time I navigated Friday evening rush hour traffic and got back to my office, the answering machine was blinking madly. I hit play, and sure enough, it was the caller worried about their crashed computer. 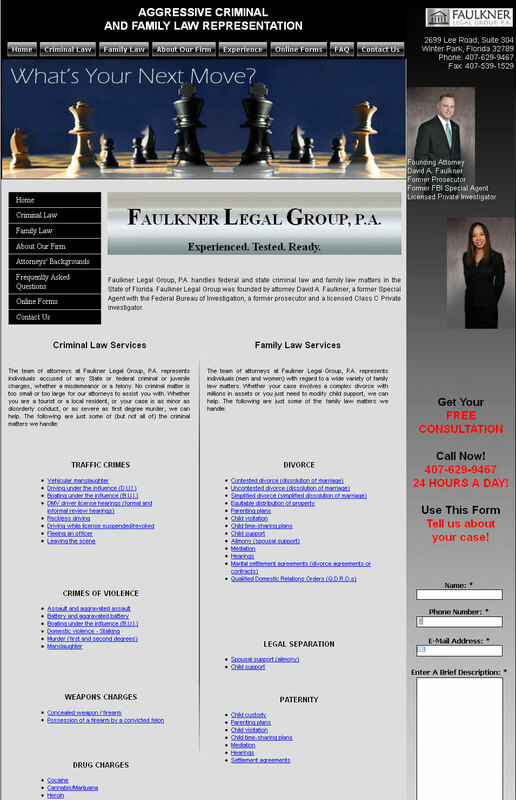 I returned the call and found myself speaking with David Faulkner, Esq., owner of Faulkner Legal Group. Apparently there had been a power outage and when the power came back on, the computer didn't. I asked the basic diagnostic questions and when I got to, "What do you hear?" I knew the problem. Mr. Faulkner heard the computer clicking. A clicking computer generally means it is stuck in a boot loop with a damaged boot sector on the hard drive. This also means that records that help a computer find the data on a hard drive were likely gone. To complicate matters, I was told that all their court records was on that computer...AND, of course...there was no backup! This basically meant that Mr. Faulkner's entire business was dependent on data that was lost on a crashed hard drive stuck in a boot loop. Naturally, loss of this data would mean the end-of-the-world to my new client. I took Mr. Faulkner's address and promised to be there as fast as traffic would allow. At Mr. Faulkner's office, we powered up the computer and I only needed a second to recognize the boot loop click. I shut down the computer and said I had to take it back to my office. Back at my office, I removed the hard drive from Mr. Faulkner's computer and installed it in one of my workbench PCs. Then I deleted the drive's partitions. Yup, this sounds scary, but it's what I had to do. Now that I had a blank hard drive, I could run a low-level data reconstruction operation. As I recall, I got the data recovery operation started around 7 p.m., Friday evening. By Monday morning, I had logged about 40 hours of work BUT I had also restored over 98% off all the lost data and returned Mr. Faulkner's computer to his office before the start of business Monday morning. In the months that followed, I began the website project for Mr. Faulkner which includes designing the logo you see above. I was in my garage one Sunday afternoon, when the sun reflected off a broom handle. I loved the color and texture, so I grabbed my Nikon and shot a few photos. Back at my office, I used the Nikon pics to design the background texture for the logo I was building for Faulkner Legal Group. Once Mr. Faulkner saw the logo design, it was such a hit, he hired a sign company to duplicate the logo design into the wall sign you see below.